Richard Joseph Jensen was Professor of History at the University of Illinois, Chicago from 1973 to 1996. He is the author of “ ‘No Irish Need Apply’: A Myth of Victimization,” Journal of Social History (December 2002). The Washington Post boasted: “This 14-year-old Sidwell Friends student outwitted a college historian”; The Daily Beast inflamed 179 frenzied readers with: “The Teen Who Exposed a Professor’s Myth”; The Smithsonian Magazine announced: “Fried’s work proves that the signs and the discrimination they represented did indeed exist.” The department chair at Swarthmore College echoed her thesis, and blogged, “Dear Rebecca Fried: PLEASE APPLY TO SWARTHMORE.” Google lists 4,000 websites repeating the story. Not a single one of these bloggers actually read her essay; they are all commenting on a misleading press release. Professor Kirby Miller, a promoter of the NINA legend, and the consultant to Miss Fried, claimed in 1985 that “Unskilled workers and servants, especially, encountered the ubiquitous ‘No Irish Need Apply’ notices when they searched for jobs in Boston, New York, and other major cities." In rebuttal to Miller, my 2002 paper "’No Irish Need Apply’: A Myth of Victimization” argued that visual NINA was very rare and that the Irish concern arose from aural sources— a famous song that everyone sang about beating up the man who wrote NINA. The NINA theme became critical to the self-identity of the Irish Catholics as victims of ethnic hostility who need to stay together to protect themselves in a hostile environment. In 2002 I showed how historians could use the new technique of computerized searching of massive databases to discover word usage. I found 12 NINA newspaper ads and no evidence of a window sign. Fried, in “No Irish Need Deny: Evidence for the Historicity of NINA Restrictions in Advertisements and Signs”, uses a much larger database and more powerful software to discover 69 cases. She claims to have refuted me. I reject her claim. Were NINA signs “ubiquitous” as Miller claims? No. Fried found only two reports of NINA signs, one in 1883 and one in 1932. The 1883 sign advertised party patronage in a government office and does not meet my criteria. She also found 20 NINA newspaper ads in one New York City newspaper in 1842-43. She says they prove that anti-Irish hostility was “often common.” However her appendix shows that for the following eight decades she discovered a total of 8 ads in New York City papers. Internet searching is a powerful tool that needs expert oversight; students who excel at computers need professional help to put their search results into a historiographical context. Otherwise their work will beget superficial or mistaken “history from a deck of IBM cards.” Window signs play two roles. A job exists here and “NINA” says no Irishman will get it. A few signs a year in a city means the impact on job opportunities will be minimal. Much more important is the second role: NINA signs created public humiliation. Hundreds of people with no interest in the job itself will walk by the window and see that Irish are undesirables. Even a handful of window signs will be a serious humiliation for the entire Irish population, since each sign is read by many people. I examined all her signs. Apart from the 1883 and 1932 cases, her cases are misinterpretations and are not relevant to the historical debate. This underscores the need for letting the class see the preliminary findings before publishing them. A fellow student could revisit her case #65 from the 1901 Monmouth College Yearbook (in which D.R. Turnbull seeks “a partner to take interest in a home. Must have a loving heart and be willing to take an active interest. No Irish need apply”) and see this is student humor about marriage. The Yearbook staff concocted this fake “want-ad,” and they touched on the friendly campus rivalry between the Scottish Presbyterian and the Scotch-Irish Presbyterian students. The 1883 sign, case #54, came from the town of Port Washington in rural Ohio, where the local police department posted a patronage job to clean lamps on the bridges. When Republicans won local elections, they replaced all the Democrats. Practically all the Irish were Democrats, so “no Irish need apply” represented routine political cleansing. (I had excluded political patronage from my 2002 article, assuming that all historians knew about it.) Other students could clarify Fried’s claim that in 1871 an English traveler validated the existence of NINA signs. He mentioned newspaper ads (not window signs) in passing, then quoted 18 lines from the NINA song. The student would report his comment, which Fried overlooked: “These words grate rather harshly on the ear in a land where all are supposed to be ‘free and equal.’" A classmate could do a Google check when Fried lists Butte, Montana, as one of the centers for anti-Irish sentiment. The Irish so thoroughly controlled the giant Anaconda Copper Company, that the local slogan was, “NO ENGLISH NEED APPLY.” All Fried’s cases melt away under classroom scrutiny. The lesson is teachers need to insist that students review the scholarly literature before they believe everything that flashes on their screens. History teachers will increasingly work with bright students applying their skills with complex database searches; students will need guidance regarding historical context. Consider the 20 ads from the New York Sun in 1842-43. Fried admits their centrality to her argument. She also admits the ads probably were prepared by two employment agencies that forwarded prospects to actual employers; she presents no evidence that the actual employers only hired Protestants. The watershed year was 1845 when the famine hit; Irish departures to the U.S. exploded from 75 people a week in 1841 to 3500 a week in 1849. Only 6% were skilled artisans, compared to 25% of the English and German immigrants. Historians agree that this flood of extremely poor, unskilled men radically changed the Irish jobs environment. So we should start in 1845. Fried found 21 classified ads for actual jobs from 1845-1932 (not counting non-business ads for help on the farm or inside the home.) She found four ads in Boston, three in New York City, two in Chicago and St. Louis, and one each in Cincinnati, Cleveland, Philadelphia and Washington, plus six small places. In response to Fried, I examined the much larger National Digital Newspaper Program files sponsored by NEH. Using all 1,841 newspapers with 9.7 million pages online, I calculate a subscriber would have to read over 41,000 pages of small print to encounter even one NINA. That is certainly not “ubiquitous” as Miller asserts, nor “often common” as Fried believes. 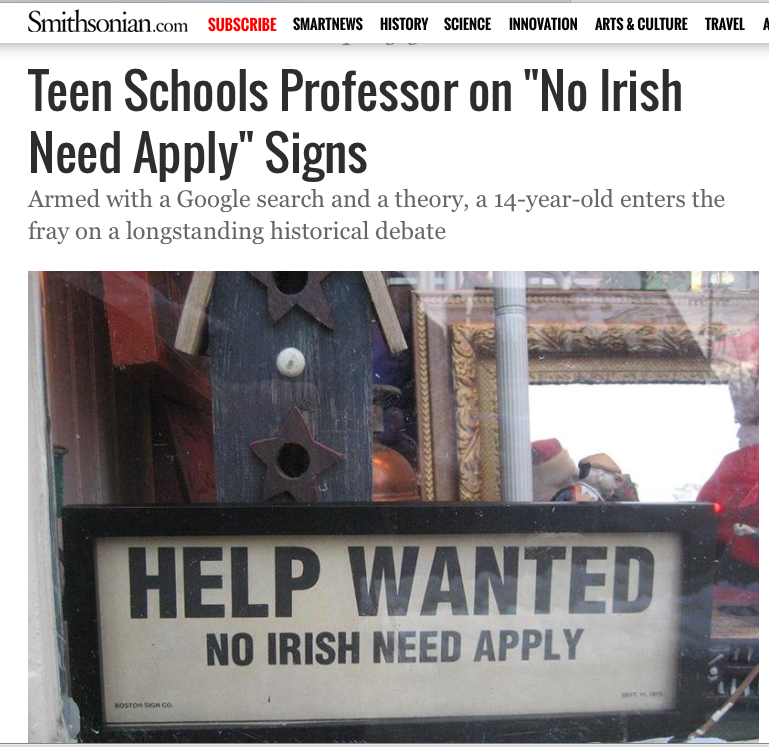 Regarding the importance of anti-Irish bias in the job market, ads provide very little information. The vast majority of these ads were placed by private households looking for a servant or they were placed by small shops that needed to quickly hire one person. They tell us almost nothing about the overall job market. Instead they indicate the attitudes of a couple dozen employers in Boston, Chicago, et cetera, over nine decades. Historians need to teach the best ways to report all the critical information in a primary source, and not just cherry pick. Fried cites Stephen Birmingham, Real Lace (1997) p 52 about a fancy Southampton Beach Club that the wealthy Murray family wanted to join in the 1870s. She mentions that someone briefly hung a NINA sign on the door. While Birmingham does not speculate whether a club official or an angry Irishman put it up, Fried assumes the former. She does not tell us that Birmingham reports that in the end the Murrays were all admitted. Another bias case melts away, for Southampton represented an episode of tolerance and inclusion. I should have been more explicit in listing the factors that were favorable or unfavorable toward hiring the Irish. Let me state those now. Unfavorable factors included anti-Irish or anti-Catholic bias by the employer; jobs requiring skilled craftsmanship or human capital; jobs in agriculture or the rural South. Negative factors also came with jobs involving salesmanship, entrepreneurship or investment of cash, and jobs in corporate bureaucracy and finance. Very negative factors emerged where Irish had been hired, then engaged in a bitter strike and had been fired. If they won the strike, the companies did not want to rehire Irish strikers. Favorable factors included the Irish concentration in fast-growing cities having a strong demand for unskilled labor, a use for gang labor, and jobs controlled by unions. Railroad construction was a major specialty of the Irish. Once finished, the railroads hired many permanent employees and the Irish fared quite well. Walter Licht reports that by 1880, the Irish immigrants "were now holding upper and lower management spots in nearly the same proportions as their native white counterparts. . . . The railroad industry, in fact, proved a boon to many immigrant groups, particularly the Irish.” City government provided many patronage jobs in police departments, schools, offices and utilities, and contracted with Irish construction companies. Mining provided jobs for large numbers of Irish men, as did textile mills and private households for women. Of course, there were jobs sponsored by the Church as priests, nuns, and workers at hospitals and orphanages. The Irish were famous for their success in politics, professional sports like boxing and baseball, and the entertainment industry. Did the favorable factors on the whole outweigh the negative ones? How much of the negativity involved low skills among the Irish, and how much can be attributed to outside biases? We do know the results: the Irish started from a very low base in the 1840s and by 1900 reached the national norm. Unfortunately for healthy scholarly exchange, the blog postings have been overwhelmingly negative of me personally. Three themes predominated. First, many bloggers simply recycle the NINA myth. Second, some speculate wildly on my political motivation: conservatives are convinced I am a dangerous far left anti-American; while liberals warn that I am a dangerous right-winger who is probably at work on a new article showing that slavery did not exist. The third trope, and by far the most serious, is that highly paid university professors are practically worthless because they can easily be outwitted by an eighth grader in terms of doing scholarly research. These attacks bolster the theme that universities are overfunded or unnecessary, which has become a very dangerous threat to academia across the United States, especially to public universities. Kerby A. Miller, Emigrants and Exiles: Ireland and the Irish Exodus to North America (1985), p. 323. Summer 2016 issue of the Journal of Social History. David Emmons, The Butte Irish: Class and Ethnicity in an American Mining Town, 1875-1925 (1990) p. 146. Donald Harman Akenson, "Irish Migration to North America, 1800-1920." in Andy Bielenberg, ed., The Irish Diaspora (2000) p 124. Timothy J. Meagher, The Columbia Guide to Irish American History (2005) p 79. See “237 results containing ‘No irish need apply’ ” here. Walter Licht, Working for the Railroad: The Organization of Work in the Nineteenth Century (1983) p 223. Kevin Kenny, The American Irish: A History (2000) pp 185-86.